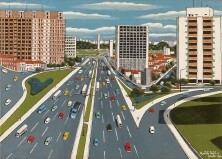 Agostino Batista de Freitas was born in 1927 in Campinas, Sao Paulo, Brazil. In 1952 he began his artistic career. He died in 1997.